Q: What do these two men have in common? They are both New Orleans restaurant tycoons. 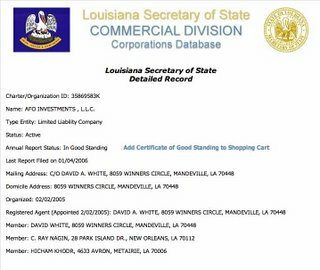 Mayor Ray Nagin along with business men David White and Hicham Khodr are all partners in a company called AFO Investments. What does AFO investments do? Apparently they are a real estate/restaurant venture with at least two known properties: Byblos and Table One on Magazine Street (and a newly posted billboard on the earhardt bridge). While Byblos was open before the storm, Table One is another story. 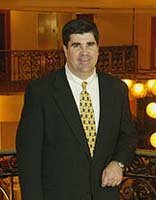 The property was renovated and opened as an upscale restaurant about a year before the strorm. After it's original renovation it was called The Living Room. Sometime between Hurricane Katrina making landfall and the city allowing the residents of 70130 to return to their homes, the restaurant was purchased by David White and became Table One. I got a post from an Anon which states that AFO stands for All For One....which flows nicely with Table One, huh? Nagin being "The One". Ray must really be a multi-tasking demi-god....to handle the responsibilities of a devastated city and open an upscale restaurant on the side. It reminds me of Neo in the Matrix fighting a thousand Mr. Smiths. This anon also states that Nagin's Director of Housing, Alberta Pate, became a restaurateur during the Katrina exodus and stealthily openend Alberta's on Magazine in order to bypass protests from local neighbors who didn't want the restaurant in their neighborhood. Interesting prioritites for a city Housing Director who was on the cusp of facing the greatest housing crisis in the history of the United States. Now comes word that Hicham Khodr is putting together a deal with Emeril Lagasse to purchase the still down and out Camellia Grill in the Riverbend area. BAM! One more asset for "The One"
Transparency Ray? Let's pull out the windex and polish the glass. You're a sitting mayor investing in real estate in your own city...that's a conflict of interest even in the best of times, much less in the current situation our city is in. Keep your eyes on potential "ripe" properties around the city which are up for sale.....Cafe Sbisa, Oswalds, etc. I'm wondering just how deep the rabbit hole goes. 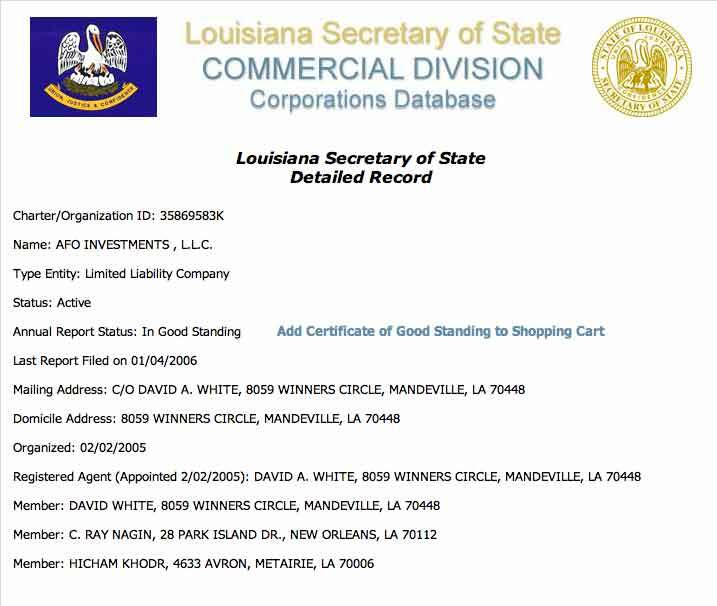 Oh yeah, and did I mention that Nagin appointed David White to the BNOB board immediately following the storm? Convenient. "Oh yeah, and did I mention that Nagin appointed David White to the BNOB board immediately following the storm?" He also re-appointed him to a five year term on the aviation board. Am I wrong about what a tremendous conflict of iterest that could be? Airport expansion or relocation seems unlikely now, but the aviation board has had its share of land dealings in the past. At any rate, nominating your business partner to any board that controls that much patronage seems as questionable as you can get. of course it's a tremendous conflict of interest....we are somewhat of a frontier town at the moment, i think we've just thrown ethics and laws to the wind. I was just looking back through the posts on the blog and I was amazed at the amount of crap I've uncovered since I first published the Meffert yacht post. I think there's enough here for a bad novel. Bravo, bravo. As always, you've nailed it.